It’s 2018, and the world’s now certifiably mobile-first. Around 56% of us access the internet on smartphones. Last we checked, iTunes had over 2 million apps. And interestingly, after gaming, the most popular category is business – an area ripe for data analyses and insightful visualizations. Whether you’re targeting individuals or organizations, whether you’re making a weather app, a stock market monitoring tool, or a powerful tool for monitoring on-floor performance, chances are you could use a chart. To stand out in the crowd, you need apps that aren’t just useful, but also beautiful – (and brownie points, if it does both expertly). And if you’re not sold on the power of visualization in iOS, take a look at this incredible responsive visualization of all the data in Wikipedia. 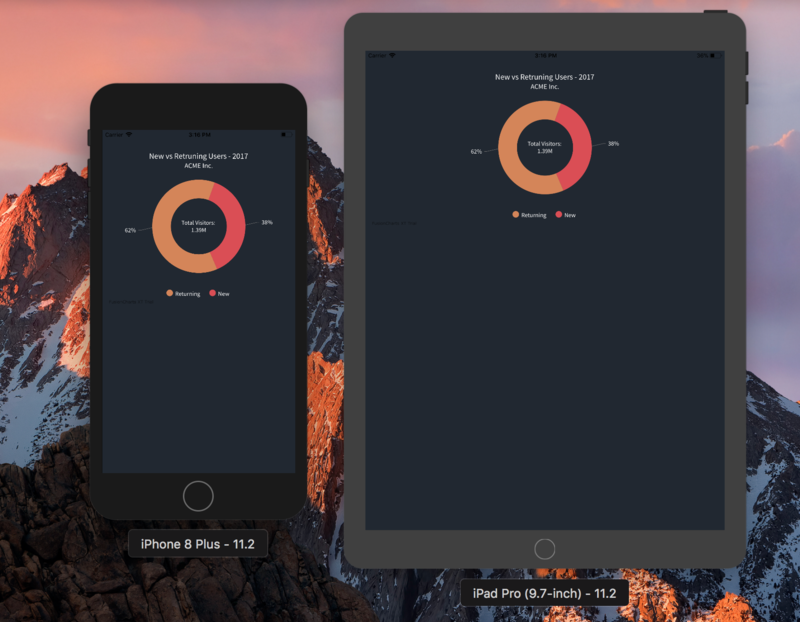 FusionCharts makes interactive charting easy, customizable, and exciting – with these steps, you can build visuals that’ll fit seamlessly into your next iOS app. This tutorial showcases how you can create interactive charts for iOS applications using FusionCharts. Once you have Xcode installed on your system, open it and create a new xcode project with ‘Single View App’ template. Navigate to project navigator sidebar in Xcode project, and create an empty html file as chart.html. In the HTML file, include chart instance which will render the chart in our app inside WKWebView which we will learn to create later. First, we will include the core packages in our HTML file and then create chart instance. Note: Please copy the files downloaded to project folder. Make sure that path specified in chart.html for FusionCharts core package JS files is accessible to the application. Also include these files in Build Phases -> Copy Bundle Resources. Now that you have the chart instance ready, let’s move on to view the application and create webview which will render the HTML file. Include override keyword for loadView() to load the layout from the storyboard. If you have a developer mode apple device, you can also check out output on your device. You can download the source code from GitHub repo. Awesome tutorial and library. I`ve been using it for a school project where I have to show a Bar Chart and a Spreadsheet like report, where it explains the data shown in the Chart. But I`ve been having some trouble to show the webView inside a containerView and not as the whole view. Definitely Joel. Please drop an email to [email protected]usioncharts.com mentioning the issue you are facing. We’ll try our best to make it work for you.